"Public Sculptures", 2008, are little sculptures whose primary material is made up of found and gathered rubbish from the streets, arranged into new indefinable, abstract forms. These Forms, made of everyday life rubbish, are each cast two times in ceramics. These two identical sculptures become gold plated in pure gold. One of these sculptures will be left in a public space. It is placed on an arbitrary location, observed and secretly filmed till the moment when taken. What stays is the identical copy of the disappeared sculpture and a Video showing the Moment of disappearance from its equivalent. 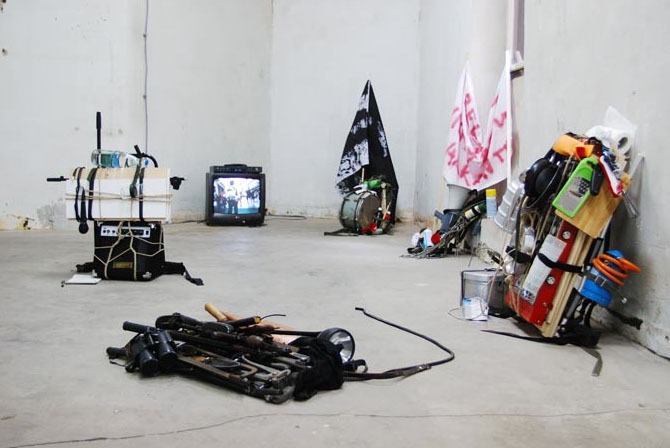 "Speaker-Backpack, Cooking-Backpack, Demonstration-Backpack, Sabotage-Backpack, Fan-Backpack", 2006, by Nasan Tur.